indoor operation, hopefully without losing too much signal quality. With a move into elder-care always a last-resort possibility, I thought it wise to have my much-loved hobby future-proofed for such an eventuality. As a start I tried a variety of frame loops described some years ago in a NZ DX Times article by Tony King of Greytown. These worked well and a small example of this type was handy for packing in the luggage with a portable receiver for use on holidays. cable which, although covering a smaller frequency range for a given physical size, appeared to offer better sensitivity and pretty effective nulling of local interference. I used the “cut-and-try” method of construction, until finding some definitive advice on page 39-1 of the ARRL Handbook (1988), from which I learned that a length of less than 0.08 wavelength was the ideal size for the conductor in a single-turn loop. For approximately the next 1 MHz tuned beyond that critical point natural resonance appears to take over, and tends to overload a small receiver. 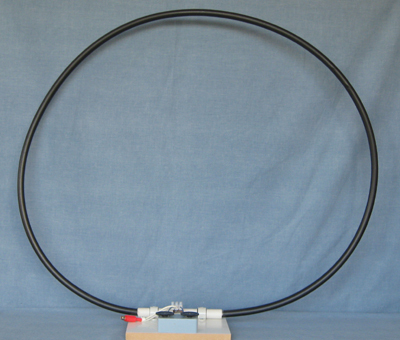 The loop on which the following figures are based is housed in a 70cm diameter hula hoop bought from the Warehouse about 3 years ago (unfortunately the latest stock available locally is of solid plastic – so I’ve turned to garden irrigation tubing to support loops of 70 cm or smaller, and 20mm PVC electrical conduit for larger square loops covering the lower 6MHz of the spectrum. I’ve read somewhere that 75-ohm coax should be used for the antenna itself, and 50 ohm for the feeder. However, the table below shows tuning range obtained, using various settings of the two mini variable capacitors in series with the loop, comparing both 50 and 75 ohm varieties for the antenna portion. Note that optimum sensitivity is in the top half of the range in all cases, so I find it better to use larger loops and old-fashioned 3-gang capacitors for tuning 49m and below. Changes in sensitivity were more clearly defined by my Sangean ATS 505 receiver, which was used for these tests. My Eton E5 reacts in a slightly different way (possibly due to later front-end technology), but gives good results in everyday use, especially with an AR2 amplifier connected in the line from the antenna. Would anyone have a ‘mud map” or drawing of the wiring to and from the choc bloc etc and the two mini variable capacitors. I’m visually disabled and will be getting some help to build one so trying to get as much info as I can. Just cannot see detail in the image. I have been asked by the webmaster to reply to your question. Is is straght-forward working out the connections from the box to the connector. Each of these little variable capacitors has two sections one being 0-60 pf and the other 0-120 pf. The centre connection of the 3 connections is the common to each section. The person who designed this intended that the sections be connected in series or parallel. 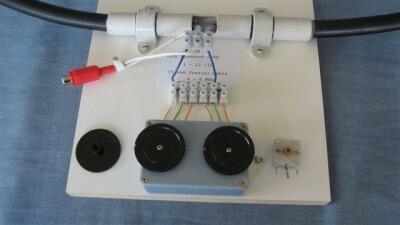 The configuration of the combinations would appear to be done manually on the loop side of the connector and probably by moving links. This is not obvious from the drawing. It is however considered an unsuitable arrangement for a vision impaired person and not recommended. There are far simpler ways of doing this using a variable capacitor, some fixed capacitors and switches. The object of the exercise is to tune the loop with a range of capacitance to suit the frequencies intended. Based on the the combinations in the article the 2 x 60 pf in series which gives 0 -30 pf is the critical factor as the minimum capacity has to be near zero to alow the loop to tune to the highest frequency. If you wish to email me direct I will draw up something suitable.